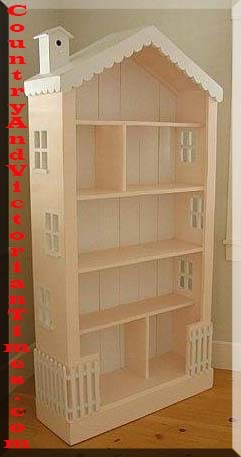 This conversion of a wooden bookshelf to a doll house will create a time of fun for your special little girl. This design is a little intricate – but it could be made fairly easy and made so that the added components could be removed later to go back to just a book shelf. Picket fence can be added to the bottom, dividers can be added to in between the shelves to divide them into room. Here they removed the top and added a pitched roof with new tongue and groove back. They cut out squares in the sides and inserted premade squares that are divided to look like windows. The back and insides could be painted out to look like little rooms with wall paper (decorated scrapbook pages) paint with stencils or sponge paintings. How about a little metal for the walls in the kitchen. The top pitch (if you make one) could be covered in large tongue depressors (available at craft stores). This entry was posted in Crafts ~ DIY ~ Projects, Home, Car, Yard, and Pets, ~Childrens Activities, ~Home and tagged Barbie, book, Bookcase, bookshelf, crafts, doll, Doll Making, Dollhouse, house, shelf, Shopping, ~Art. Bookmark the permalink.